The wearable tech industry is poised for massive growth. Forecasts predict worldwide spending on wearable technology will reach $19 billion by 2018. And by 2020, over 150 million wearable devices will ship worldwide. - Continuously decreasing cost of data, and the significant backing from huge companies including Google, Apple, and others. 1. Energy Use at Home-Wearable tech allows more user control over a home's energy. For example, Nest’s Learning Thermostat has a built-in motion sensor, putting your home’s HVAC system into an energy-saving 'away' mode after a period of inactivity. Imagine how much energy could be saved if a device on your wrist signals your thermostat to go into “away” mode the moment you leave your home or neighborhood. 2. Energy Use at Office-Wearable technology can provide information like body temperature, heart rate, and respiration, giving a picture of an individual's physical comfort. Voice recognition software could even detect when people are complaining about feeling too hot or cold. Wearable tech can also help to condition the person, rather than the entire space. It's more efficient to make an individual person feel comfortable, rather than heat or cool the entire space. In an office setting, think of office chairs with heating elements, wristbands that cool your wrist like that from Wristify, or vents that determine personal air flow like those from Ecovent. 3.Personal Energy Profiles-In a coming era when energy use becomes not just highly personalized, but attached in fact to individual people, it’s not hard to imagine developing personal energy profiles of our individual demand and consumption. And that could open the door to personal energy bills. Usually we bill our energy use to our energy-consuming assets—electricity and natural gas billed monthly for our home, for example. But imagine if instead of assigning energy consumption to our assets we re-assigned that energy consumption to ourselves? Could wearable tech further open the door to a personal version of demand response? What if wearable tech, in addition to sending personal information out to the systems around us, could also receive signals back to us, such as from your utility. For example, utilities could signal a Wristify bracelet to cool a person instead of an AC unit cooling a entire house. This report discusses the market opportunities in all sectors, and reveals what we believe will be THE most profitable piece of the wearables market in the next 3-5 years. 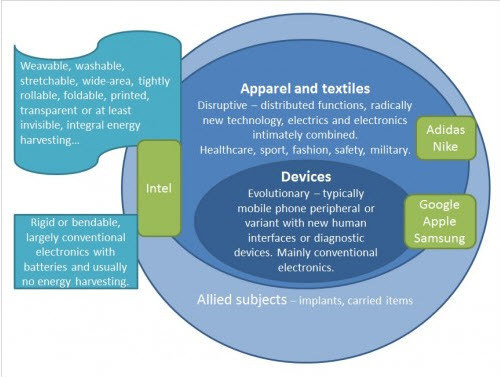 This report discuses the market potential for various sectors of wearables. We see developments in key technologies such as Augmented Reality, Body Area Networks, Ambient Awareness, and Peer-to-Peer Communications as drivers for evolution in consumer perception of value and willingness to engage in new forms of communications, content, applications, and commerce. The miniaturization of technology has reached a point where a variety of sensors and other tech can be built into wearable gadgets (many piggy-backing on a smartphone's connectivity, processing power and local storage) that enhance the user's life in some way. Examples are health monitoring and activity tracking, environmental sensing, data monitoring and recording, collaboration, authentication and augmented reality. - And employees will bring everything from personal fitness trackers to smart clothing into the workplace (and onto your network) just as they do with smartphones today. - Wearable technologies will also emerge in the huge disability market (such as aids for the deaf, blind, paralyzed and elderly). - In manufacturing and enterprise markets, wearable computers for hands-free operation will continue their popularity in field service and assembly lines and warehouses. - Forecasts for global smartwatch shipments will grow from 1 million units in 2013 to 7 million in 2014. Credit Suisse expects the industry to grow from between $3 billion and $5 billion today to $50 billion within five years. 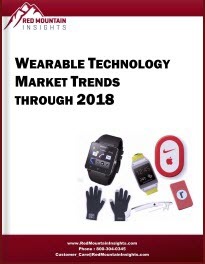 This report is a must-have for professionals interested in creating profit from the wearable computing market.